The last trick shot is one you have to see to believe. It all started on a Friday a few years ago. At the end of my P.E. class, one of my students challenged me to shoot a half-court shot, and I made it on the first try. The kids were impressed, and they wanted more. So for the rest of the year, I spent two minutes at the end of each P.E. class (I’m a K–5 P.E. 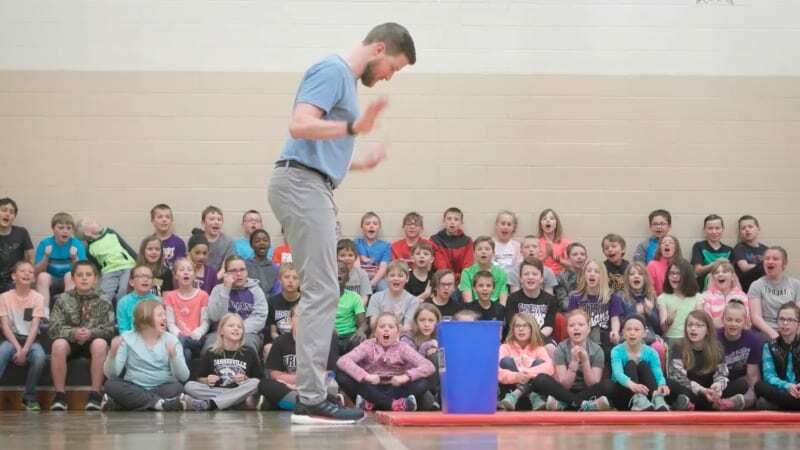 teacher in Barnesville, Minnesota) shooting half-court shots. The rules were simple: If I made a shot during the two minutes, they had to do push-ups. If I missed, I had to. The following year, the kids challenged me to up my game even more. They wanted to see more than just the half-court shot. At a lot of trick-shot-makers on YouTube were really popular. So I started coming up with all sorts of trick shots and challenges. No two Fridays were alike, and the students couldn’t get enough. I loved having this interaction with my kids, and I saw how much it encouraged them to be innovative and creative, too. Recently, I decided to trade in my basketball for something different. I now use plastic water bottles in my trick shots as a way to get kids excited about recycling. Since only three out of every 10 plastic bottles actually make it into the recycling bin (surprising, right? 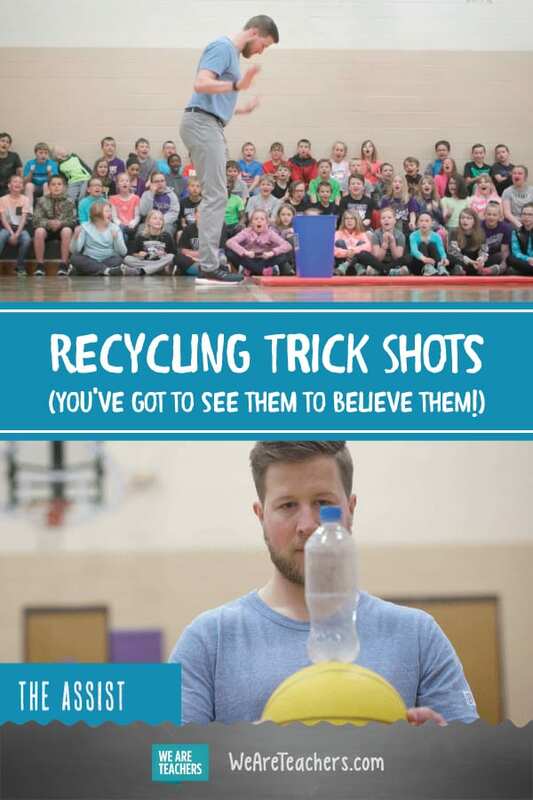 ), I thought using plastic water bottles in my trick shots would be a great way to help students remember the importance of recycling. Here’s a video of the results. Take a look at the five recycling trick shots in the video, along with tips on how to do each one. My students have loved these just as much as the basketball trick shots, and it really has helped them become more aware of their own habits when it comes to recycling. It’s definitely helped ensure more bottles are going into the recycling bin around our town, which is always a good thing. This one seems easy at first. Once you get into it, though, you quickly realize it’s actually pretty challenging. I tell my students to start small: Toss the plastic bottle just a few feet in the air. Get the rotation of the bottle right, practicing until you feel really confident. Then once you master that, go higher and higher until you can throw it 20 or 30 feet in the air and have it land right in the recycling bin. Before you even start “bouncing” the water bottle, you need to get your walk and rhythm down. You might even want to count your steps to figure out how many it’ll take you to get alongside the bin. Once you’re ready to start bouncing, make sure to give your wrist a strong flick. This will ensure that the bottle has enough momentum to land in the recycling bin. You’ll see in the video that I go between my legs, but this is an advanced move. Master the basic walk-by first! This is a good one that almost anyone can do. Start with your feet together and pinch the bottle between the arches of your feet. Then as you jump up, kick up and out. You’ll want to have your knees slightly bent before you jump. It’s almost like you’re trying to touch your toes as you explode into the air. At the peak of your jump, “toss” the plastic bottle into the recycling bin. This is always a student favorite. Try standing about a step behind the bottle at about a 45° angle. Be sure to point your toe and kick through with your stronger foot. Understand that the kicking part is easy, but aiming is a bit more challenging. You want to kick the bottom of the bottle. As you kick, make sure the laces of your shoe are aimed at the recycling bin. This will make your kicks more accurate. This is definitely my trickiest water bottle shot to date. It’s the most difficult to control because you have to work with the spin of the basketball to give your bottle the momentum to make it land in the recycling bin. You’ll first have to master balancing the bottle on the ball, which is a challenge in and of itself. Then, you’ll want to drop the ball so that it has some front spin, propelling your bottle forward toward your target. Once you’ve figured out where your bottle usually lands, adjust your recycling bin placement. My students definitely love practicing these trick shots, and they’ve even impressed me by inventing their own. I never thought trick shots would have such an amazing, positive impact on my P.E. class—and recycling—but I’m sure glad it has!